I assume this is a 16 valve (4 valve per cylinder. The BB should be the big valve version which makes more power but they tend be more prone to cracks. 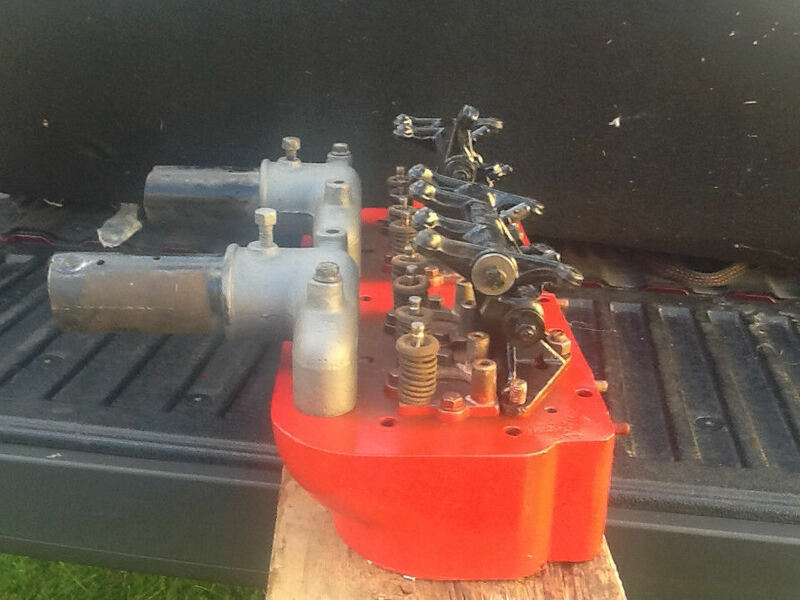 completeness; valve train (rocker arms, push rods etc), manifolds, valve covers. Ross they use standard Model T valves. You might want to use heavier springs. Check your valve guides for wear you may want to go with valves that are 1/32 over size. Do you have all three parts? Ross those are factory competition exhaust manifolds, good score. I need two if you run a crossed any more. Maybe here is a opportunity to make a pattern and cast a few?? Les, I could use a set too. Well we will see if Ross is interested in helping us out. Perhaps he just wants to sell the outfit. I am not in the market!! Hey guys not going to sell just trying to find enough parts to complete the set up so I can put it on an engine. Not sure how to go about getting a pattern made to cast some. If you do have a set of split Roof exhaust manifolds, do give some thought at letting Les make some patterns. I have sent Roof valve covers to him for another one of his projects and they were returned timely and in good shape. Please post a picture of what you have, they are hard to find. Mike & Les the head & manifold are at the other shop I will try to get pictures before the weekend & post them. I could use a set or two. Ross I loaned Les the traditional 3 piece exhaust manifold so that he could have some cast and got them back promptly without issue. It would be of great assistance if we could borrow yours for a couple of weeks to make a pattern of them. 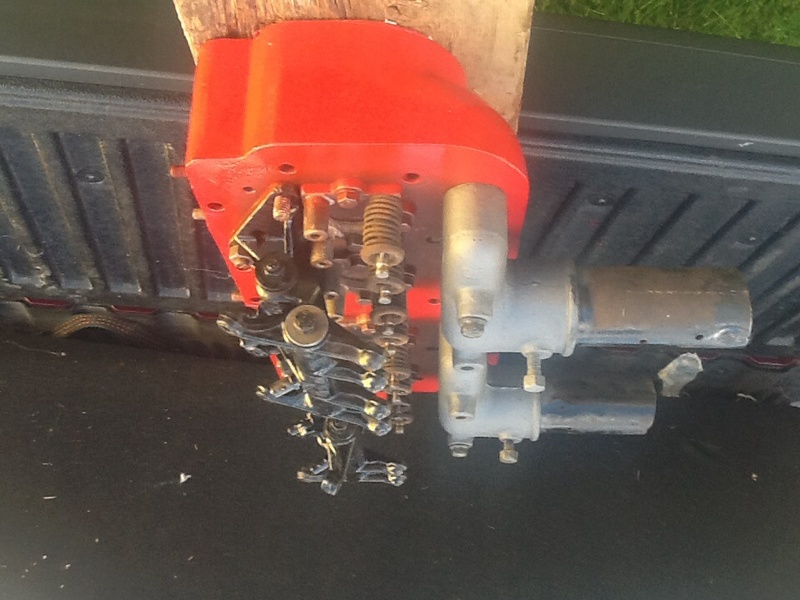 You have a set of Roof competition exhaust manifolds, very nice find as these are very hard to come by. I hope that you would let Les make a pattern of them as we need to have some of these for us speedster guys. Sorry about that it should be to the attention of Ross. This is a BB at the Museum of American Speed in Lincoln. All exhaust manifolds for BB's are scarce whether the two or three piece but the internet has made those that are out there much easier to find. Ross do you have push rods? Well those like a pretty easy pattern to make. Unless I am missing something they appear to be both the same, so only one pattern and core box needed. John what you see in the picture is what I have. I'm missing the push rods the adjusters And the extensions for the exhaust valves and intake valves and springs and valve cover. 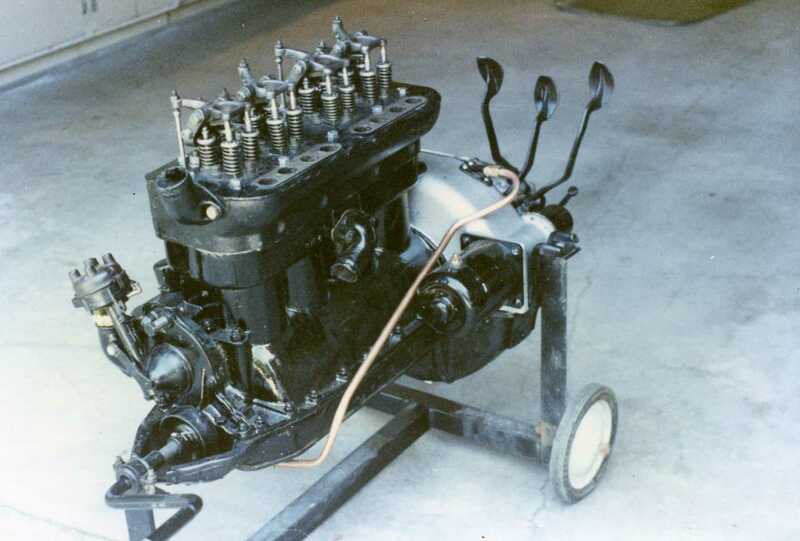 I have no intake or carb either I guess the valves and springs are just model T parts. Push rod were two piece, do to the fact that Roofs head didn't line up with the valve guides in the block. 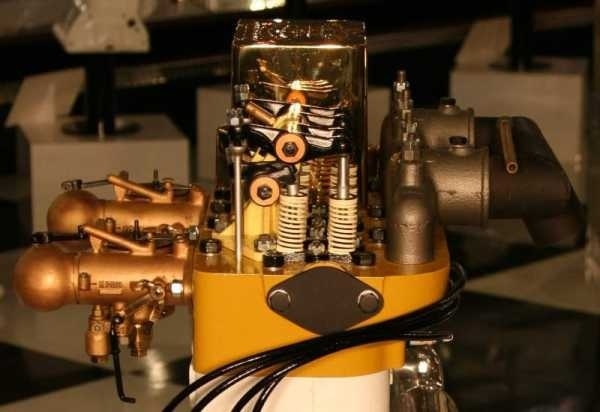 Model T valves work but you may want a little higher spring pressure as they will float. Of course the cam grind has a lot to do with float. With a little work on the head and block a one piece push rod will work as I have done on four B and BB heads. The adjuster you can get at Smith Brothers. Google them with push rods in the search. If one piece push rods are used, a dimpled lifter is a plus. I used standard pushrods (shortened) from some brand of British sporty car (can't remember the name). These are smaller in diameter and have spherical cups at the rocker end. The matching ball screw is a thread match for the Roof rocker (5/16-18). I used adjustable lifters...removed the screw (1/4-28) and replaced with a socket head screw. Ran a drill into the hex and cleaned it out and left a drill end pattern in the bottom...ground the pushrod end to match. I need a set of exhaust valve extensions, so please count me in!!! Valve springs. I need to think about that. Here is why. I built a hot T flathead ( big cam). The stock T springs would allow the valves to float about 4500 rpm, so a built in rev limiter engine saver!!! I realize on this they will float sooner with the heavier valve train. Still very little risk (probably none) of piston valve contact given the size of the combustion chamber. Les I have a spring number from SBI on a little heavier spring that will probably work. (I bought 32 of them so I hope they work) I'll get you the number. What is the stem diameter of the valve. John Steel needs a couple of sets for .327" valves, haven't heard from Ross but will make a set for him also. I plan to make some extras as they are run off of on a C&C so a few more won't cost much. My BB floated valves at 2500 RPM and I change them out to 60 seated and 100 lbs open. Was concerned that the cam (Model T 280 lift) would start flexing with much more pressure. Haven't found top end yet but valves are not floating. 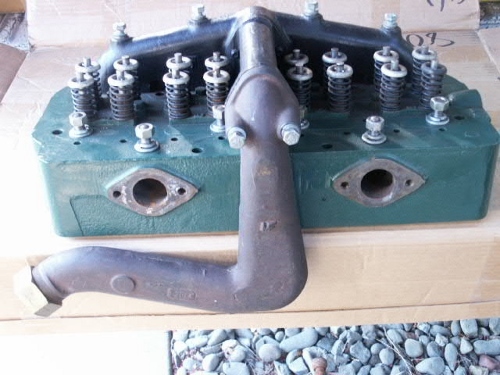 Are valve covers available for the Model C Roof 16 Valve head? I could also use an intake manifold. Thanks. 1. I personally don't need these items, so therefore my number ONE customer (being myself) is not interested. Usually I can justify these casting projects because I NEED it. Not in this case. 2. Looking at the photos this looked like it would be a simple casting. On close examination it is a difficult piece to make it look exactly like Roof made it. Roof made it so it has very uniform wall thicknesses. Probably to reduce the potential for heat cracking. To do this they used a EXTERNAL core as well as a internal core. They obviously also struggled to get good castings and had to use "chaplets" to support the internal core. I visited with my favorite old pattern maker and he said that if he was to make it he would charge me almost $2,500.00, and that is his good friends price. 3. Probable sales of castings. At best 10 pieces and I doubt that. So they would likely cost $400.00 EACH, by the time the costs are added up. My head is only a B and I already have all the pieces I need. So sorry, I won't be helping on this project. I do have the valve covers as mentioned above, as well as the "dog leg" and the cross piece for the low performance B 16 valve Roof head.